The de Havilland D.H.83 Fox Moth is a single-engine five-seat light passenger biplane aircraft produced by the British manufacturer de Havilland Aircraft Company. The D.H.83 Fox Moth is based on the de Havilland D.H.82 Tiger Moth. 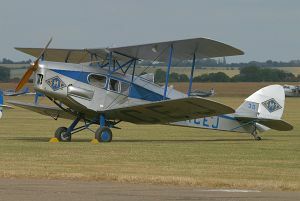 The Fox Moth was also produced by de Havilland Canada in the D.H.83C variant after World War II.